Tore down the top end, to track down an oil seepage. I suspected the top cover, and i think i was right. Added star washers under all the top cover bolts, to keep torque for a little longer. While i have the carbs off, gonna do the Clark's teflon throttle shaft upgrade. That should get rid of my vacuum leak. Edited 1 time(s). Last edit at 12/30/2017 04:43PM by viewmaster. 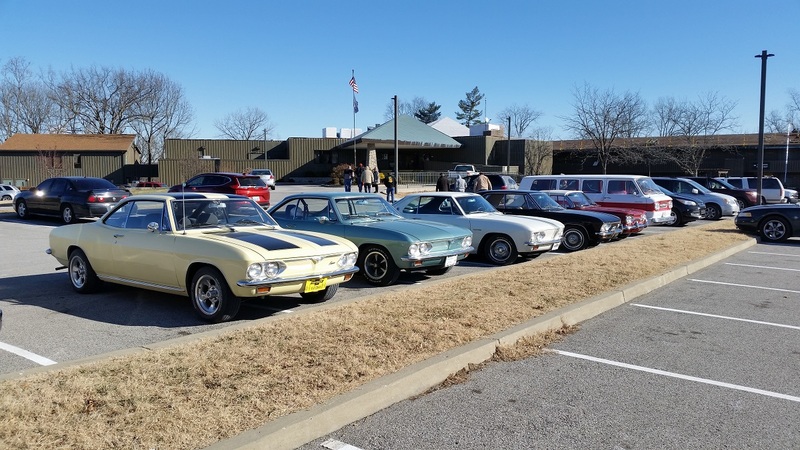 January 1, 2018 Polar Bear Run with local Vintage Motor Car Club. 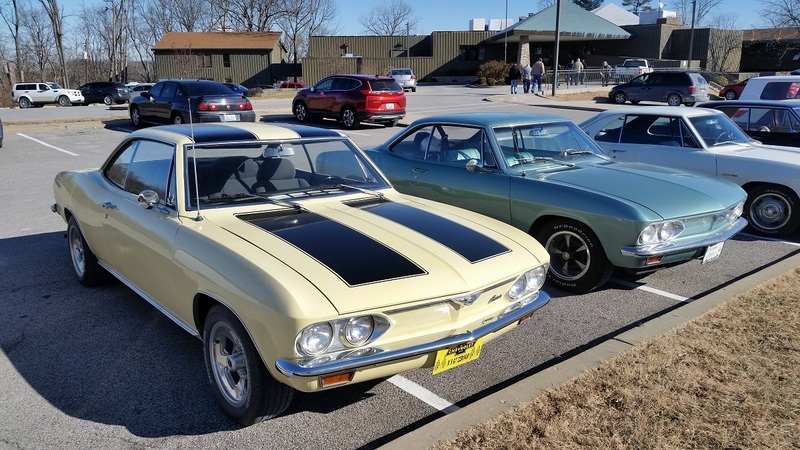 Actually, it is more like an un-official Corvair Chapter of the VMCCA. 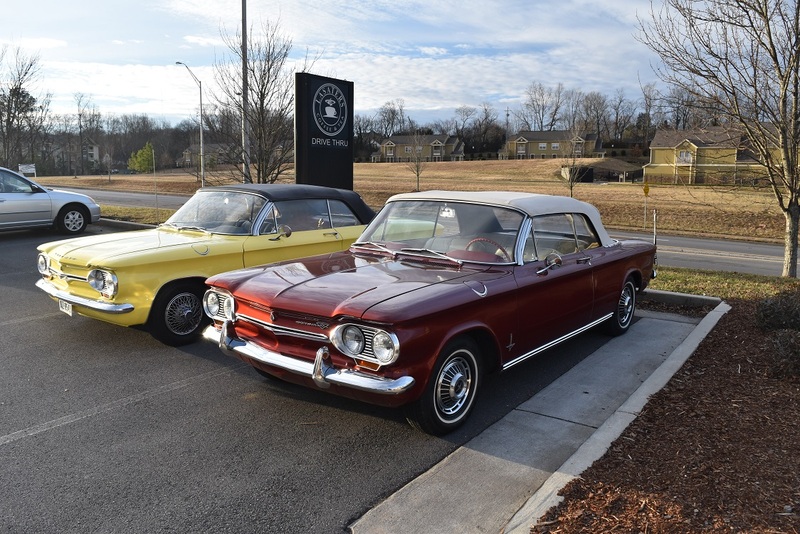 The Corvairs always outnumber all the other cars. Richard Payne (Ratt643) and I participated. It was 6 degrees when we left the house this morning. It warmed up to 16 degrees by the time we got back to Lexington, so we stopped at Baskin Robbins for some ice cream. Richard's is the yellow 67, I'm in the turquoise 66. As I have said before, my Rampside is used for its intended purpose constantly - hauling. Well as I’m sure many locales do, the garbage convenience center inisists all loads be covered with a tarp and tie downs. Fine except that corner by the ramp. The stake pockets work for the other parts. This has usually meant I tie the straps to the passenger door handle! Well I finally corrected that. This took about 2 minutes to bolt on and ought to make life easier! 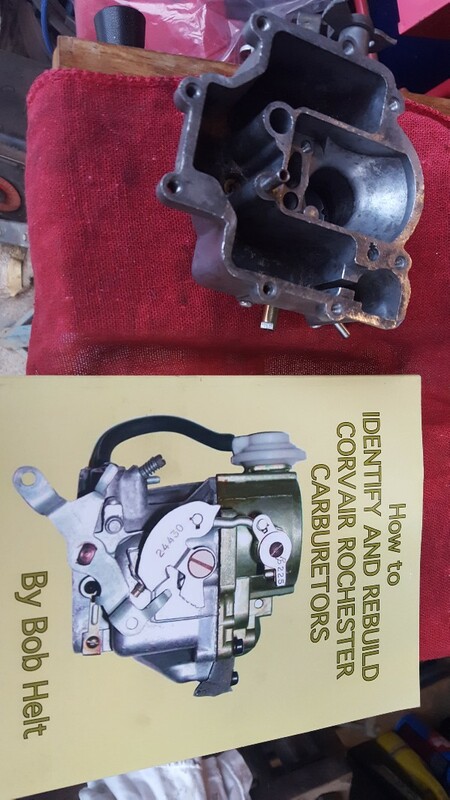 Last night, buttoned up carb rebuild, after doing the Clark's throttle shaft, teflon seal kit. WHAT A FRIGGIN PROCESS THAT WAS!!!! 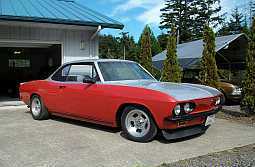 Still having issues with Cal Corvairs, rebuild kits, having wrong size, aftermarket fuel inlet jet. So...will be installing these, back in "Whitey", for a trip to Kettleman City, this Sat. Show us the different inlet valves? Why not use the old ones if they don't leak? Matt, I did use the old ones. ill see if i have pics. Front seatbelt install completed. I opted for 3 pointers in the end. With no factory mounts I had to do it all myself. Worst part was the upper pillar plate which I installed using some wire, patience and cunning. Wasn't today but Friday. Finished up the Civic steering joint shift coupler, and swapped the more correct horn button onto the steering wheel. 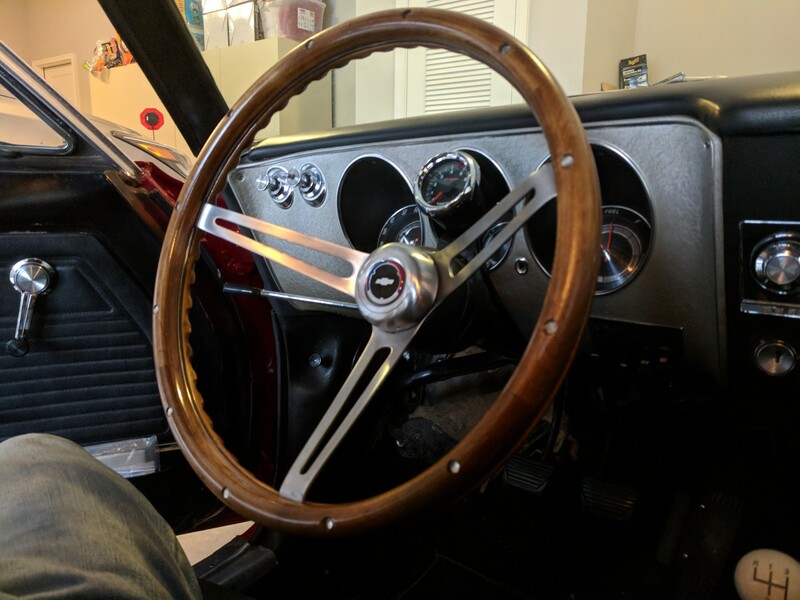 I installed the colt disk brake setup I had on the shelf on my wife's '64 today. I had been driving it this past week and the font brakes were getting a little iffy. Well I had this turn key colt setup sitting on the shelf since I took it off my '63 earlier this year when I swapped it out for a LaVair setup. I had been over driving the colt setup in the '63 with its turbo. I think the pg 110 in the '64 will do just fine with it. 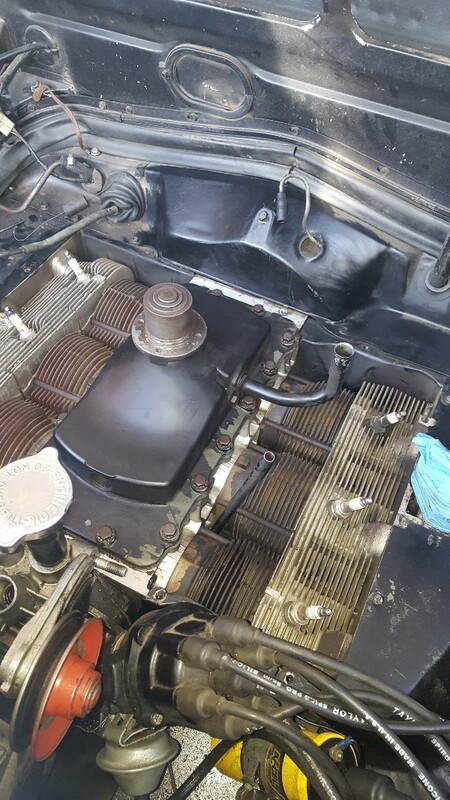 I installed one of redone76's oil pan rails on aforementioned 64 this morning. Most of my cars have aluminum pans, but this is such a neat idea I had to try one and the 64 had its original pan. I cheated a bit and used a jack and board to Oh so gently hold the pan in place while I removed the bolts so I didn't have to remove the pan. I'd had it off a while back for the standard straightening and new gasket anyway. Also had installed longer bolts then so that made it easier as well. Took maybe 15 minutes. Neat product! Then I took it out for a car wash and fresh tank of gas. Disk brakes make such a difference! You sure seem to keep busy! Now the wife and kids are safer! Attended our local Cars and Coffee yesterday morning. Since it was below 32 degrees ( 23 to be exact) I kept the top up! Fixed an oil leak 4 to go tired of looking at Exxon everywhere I go. On Saturday afternoon, got it back from Rex Johnson's into my own shop. 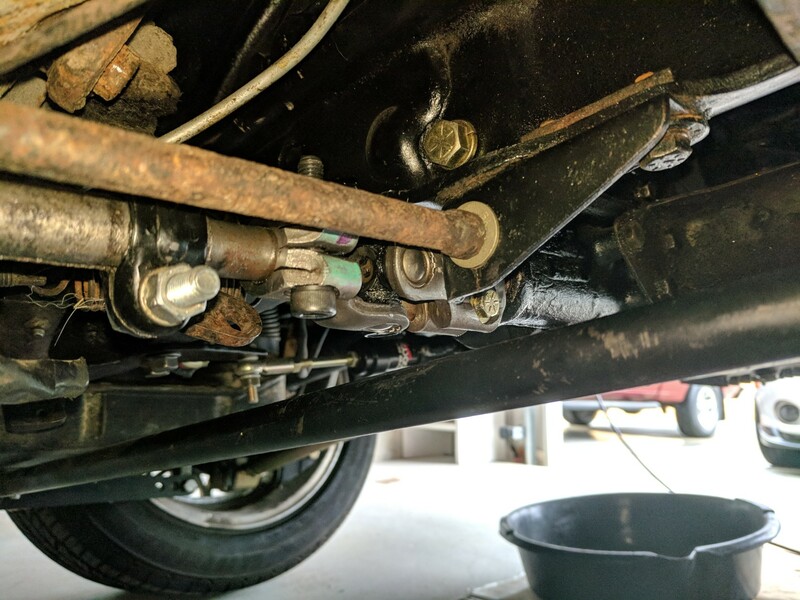 Today will clean it up, put it on the new jackstands, take off the wheels and tires and get it ready for Duane Westlandt to come down to have a closer examination and tell me what I need to start on. I'll follow his directions on the process. In related activities, will assemble the new 40lb glass bead blaster to prepare for getting the fasteners and suspension bits cleaned up. 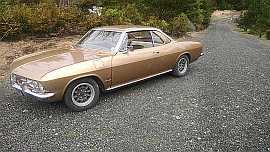 Same car I bought in 1/68 the night before I went to Viet Nam he second time. Got it back in 8/15. 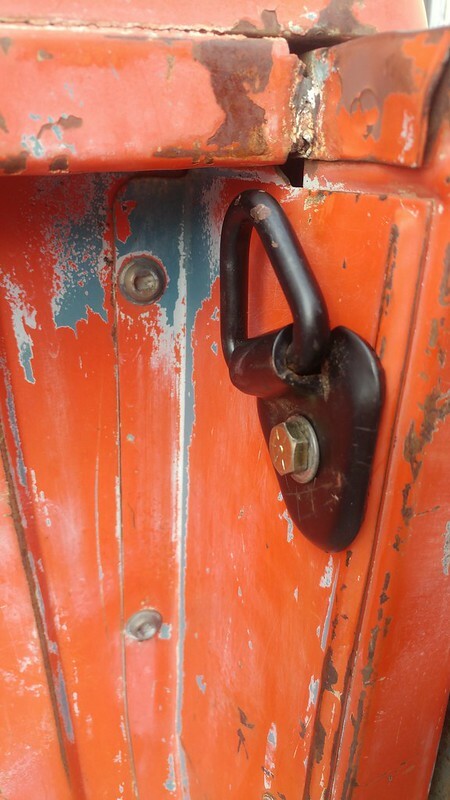 Plan its first public runout come July. Spent most of Tuesday and Wednesday reorganizing the shop for later project work efficiency. Sorted various parts into newly redone and ready to install, needing to be redone, and old for sale later on. Got some room around the car for later work. Picked up the new front LM trim piece last night at the Corsa Oregon meeting. Will be assembling the new blaster cabinet today and tomorrow. Saturday will be moving the drivetrain that Rex assembled -- I paid him for it last night -- over to my shop, where I assembled a stand/table for it capable of holding ton. Duane gave me a list of things to do, and I'll set about doing them sometime later today. Sometime next week might be able to drop in on him and have him show me how he wants the various fasteners, clips and other bits cleaned for refinishing. His list also includes contact information for some local experts on glass, rechroming/refinising and other useful topics. Time to push on into this project.